I told a guy on the trail that I always try to get out for a New Year’s Day hike, though the facts don’t back me up: Just two First Day hikes in the past five (2007 and 2005 if you’re curious). With any luck I’ll stay in a better groove in years to come, assuming no ice storms or swine flu epidemics ground me. Salem Lake Park felt like a good place to walk in the new year. 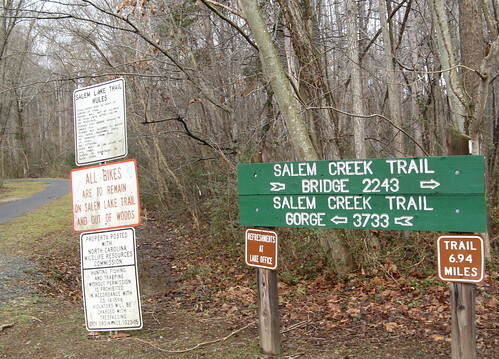 Salem Lake Trail is 6.9 mostly flat miles around the lake’s shoreline. 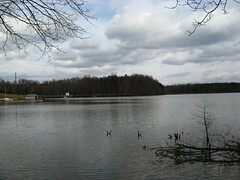 Salem Lake supplies some of the city’s drinking water, which means the city has a vested interest in keeping the place ship-shape. 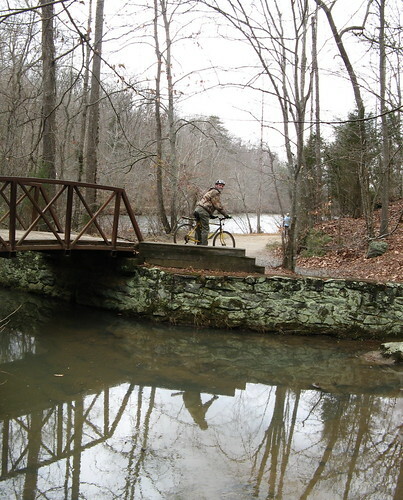 Hiking purists might look askance at the trail — it’s wide enough for a bulldozer, welcomes bike riders and has a difficulty rating of 2 on a 10 scale — but anybody who enjoys a pleasant lakeside stroll will swallow their objections after a couple miles. 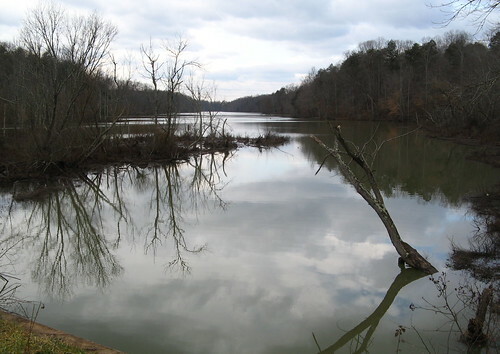 The lake is especially rewarding to birdwatchers and shutterbugs. 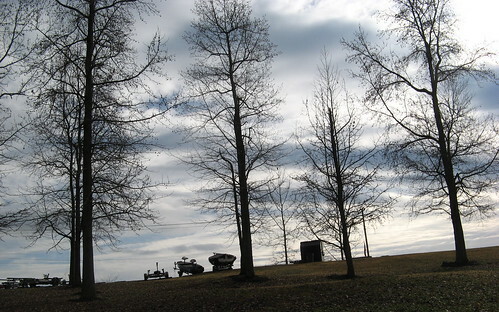 Despite mostly overcast skies, I managed to snap a few interesting pictures. The lake doesn’t see huge populations of migratory birds, unfortunately, because this part of the country isn’t a major “flyway” like the Mississippi River Valley and the Pacific Coast. Still, I saw a guy hauling a huge spotting scope on a tripod, so there must’ve been some birds worth seeing up in the trees. I admit a flat hike within the city limits won’t send cold shivers of excitement down the spine. But it beat the hell out of staring at a computer screen or nursing a hangover (not that I had one; I think my last “fun” New Year’s Eve was in 1993). Got a lot of shadowy shots like this one near the park’s marina, where people can launch boats and attempt to snare unsuspecting aquatic creatures (no fishing from the shores, incidentally). I started my hike below the fairly large dam that holds back the lake’s water. Note there’s a spillway that might be impassable after big rains (and might be a sheet of ice on cold winter mornings). Trail junction sign. 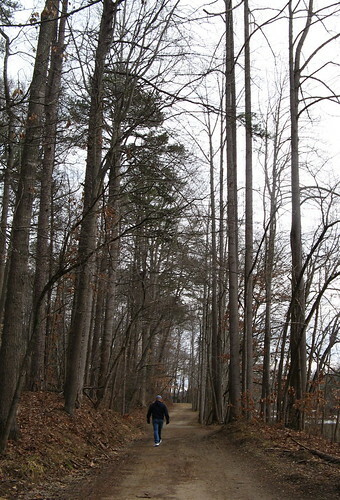 The paved path at the far left is the Salem Creek Trail, which goes all the way to downtown Winston-Salem (about 4.5 miles one way). This is the most extensive greenway in town. Couldn’t tell if this bird was actually shivering, but he sure looked cold. 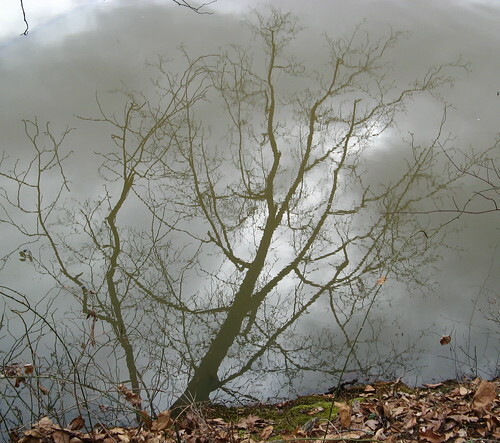 Couldn’t resist one of the ol’ reflected-tree-and-clouds shots. Dense timber surrounds the lake. Winter’s one of the best times to come because the leaf fall opens up expansive views of the water. It never gets cold enough here for the lake to accumulate an ice sheet strong enough to bear skaters; I consider that an asset. Another look at the lake from the far eastern end. 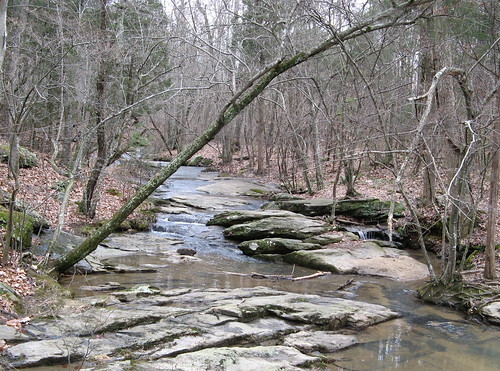 A nearby trailhead along Linville Road has parking for perhaps a dozen cars. A woman and I had quite a discussion on what kind of bird this is. She suspected it was a cormorant; I’m not entirely sure but it does have a similar bill. 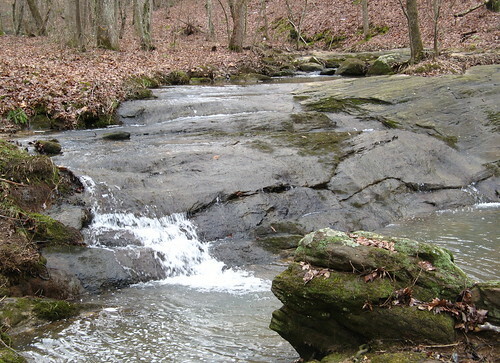 Water tumbles down a rocky stream into the lake, less than a mile from the main entrance. A guy on a bike urged me to wander up a faint trail to check out a rock formation. Very peaceful at this point. Too much light to get one of my favorite blur-the-water shots. Another guy on a bike told me he thought this was the prettiest place in Forsythe County. I was in no position to argue; I almost always leave the county to go hiking. Rowing scull, presumably for the Wake Forest University rowing team. I like the photographic prospects here — early mornings when the water’s flat and sunsets on partly-cloudy days could prove especially photogenic. One of the hikers I talked to spoke of a superstition that whatever you do on New Year’s Day predicts your activities for the coming voyage around the sun (proud to say I spent nary a moment pondering Tiger Woods’ sexcapades; that is so2009). Something to dream of: A year of no travels exceeding 2.5 mph. Nice pictures and trail descriptions Tom! Got here from your post at the Trailspace forum. 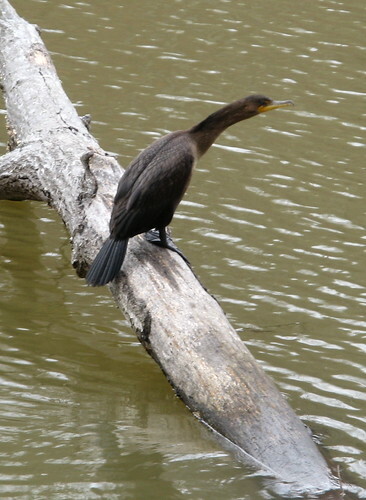 I like the shot of the cormorant. Thats what it looks like to me. I just watched “Master and Commander” with Russell Crowe and it looks just like the stance of the same birds on the Galopago’s Islands in the movie. 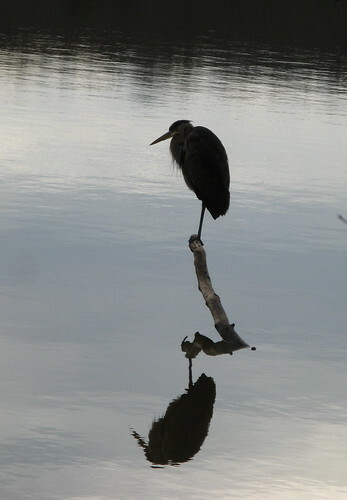 I also liked the Heron shot. I dont see as much wildlife down here in Flagstaff as I did in Jackson Hole so I like seeing bird shots very much. No need to downplay or depreciate the abundant, simple beauty surrounding you! Although I like your humorous take on doing so! Oh, yeah, it is a cormie!